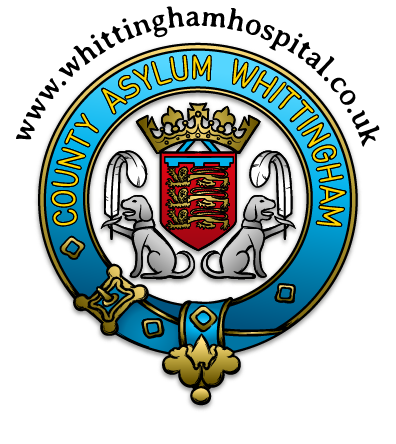 This site has been produced by Phil Knapman and Ken Ashton as a result of research into the origins and history, through to the closure of Whittingham Hospital. We would like to record out sincere thanks to all the people and agencies who have rendered us assistance in this project. Whittingham Hospital opened officially on 1st April 1873, built by bricks made on site, the source being what became to be known as the “duck pond” but referred to on maps as the “fish pond”. The kiln for the manufacture of the bricks was situated, apparently, in what is known “Super’s Hill Woods”, at the back of the hospital, on the road to Grimsargh. The hospital was built in four “phases”, the first being St Luke’s (the Main), followed by St John’s (the Annex), then Cameron House, and lastly St Margaret’s (the New or West Annex). In addition to these ‘divisions’ there was also a Sanatorium of fourteen beds built for Infectious Diseases, which became known as Fryars’ Villa, later to become part of the accomodation for the resident staff. The hospital served the community for almost 150 years, and, in its’ day, was a virtually self sufficient community. Proposal for an additional Asylum within Lancashire was called for and, following decisions as a result of the Local Government Act of 1888, it was decided to build an Asylum. The first choice of site was just behind Fulwood Barracks in Preston, but this gave way to a preferential site at Got Field Farm, to be known as Whittingham. This site was chosen, primarily, because there was a good natural supply of fresh water more readily available than other sites, and it was within easy reach of Preston. Our sincere and grateful thanks are extended to the following for their assistance and/or contributions to this site, all have been much appreciated: R. Shenton; J A Black; M. Clark; F. Knapman; M Lavery; S. Mann; John McGoldrick of Lancashire Museums Services; N. Moon; Betty Smith; D. Wilkins; Members of 28DL; Nigel Roberts; Thomas M Leigh (USA). If there is anyone you would like to contact, please feel free to use this site as a go-between. We have had some wonderful results recently and brought together people who worked at Whittingham many years ago, did their training, and moved on. Now, they have had the opportunity to get in touch with each other again, and renew old friendships. We would welcome comments and tales of past times from people who worked at Whittingham and look forward to producing further sites to include many of the amusing anecdotes associated with such institutions. If you have anything you feel you would like to add, comment upon, or a tale to tell, please let us know, we can be contaced at the email address below. If anyone has a relevant site and would like a link adding to this site, please let us know.